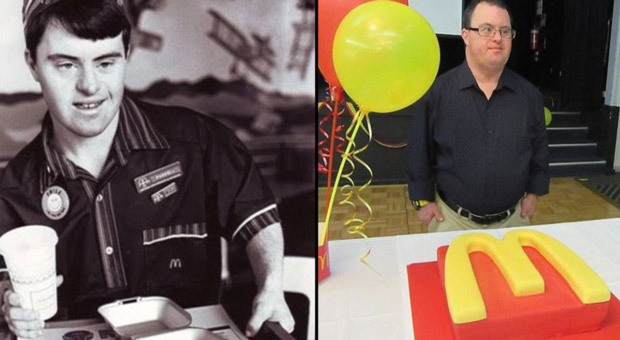 A man with Down syndrome is retiring after working at Australian McDonald’s for 32 years, according to reports. 50-year-old Russell O’Grady, dubbed “the best-known person in Northmead,” began working at McDonald’s in 1986 at the age of 18. 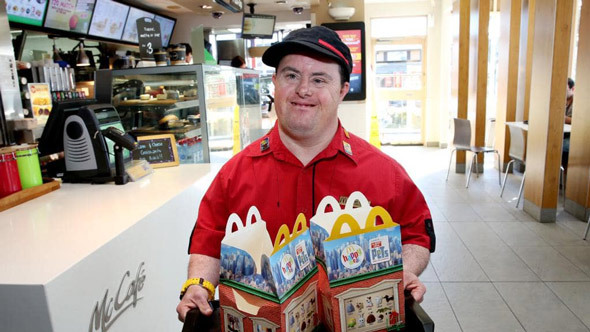 Now, after 32 years of service to the fast food giant, he has become an icon at the restaurant, paving the way for others with disabilities to hold long-term jobs. O’Grady received support and training from Jobsupport, a government initiative program that helps people with intellectual disabilities find paid work. Mr. O’Grady was one of the first to have access to the program. “Russell’s impact on people in his community is without a doubt exceptional,” Jobsupport assistant manager Wynn Visser stated to CTV News. According to the Epoch Times, for the last three decades, Russell O’Grady has worked three days per week cleaning trays, sweeping the floor, and greeting people. “We’ve got regular customers who come in to see Russell on Thursday and Friday, and the staff look after him, so we’re going to miss him,” McDonald’s supervisor Courtney Purcell said. His father, Geoff O’Grady, told the Daily Mail that he’s become sort of a local celebrity due to his job at the restaurant. “People stop him on the street and shake his hand. He’s very affectionate, dearly loved and appreciated, to such an extent that we just don’t believe it,” he said. “Somebody said to him ‘are you handicapped? '” and his answer was: ”I used to be when I went to school, but now I work at McDonald’s,” he said. “It really helps him, he gets a lot of social interaction and makes him feel like part of the community,” Jobsupport trainer Nikita Vandaru was quoted by the Herald as saying. O’Grady decided that retiring would be best for his health. He will now spend most of his time on his hobby, ten-pin bowling, at the Northmead Bowling Club. 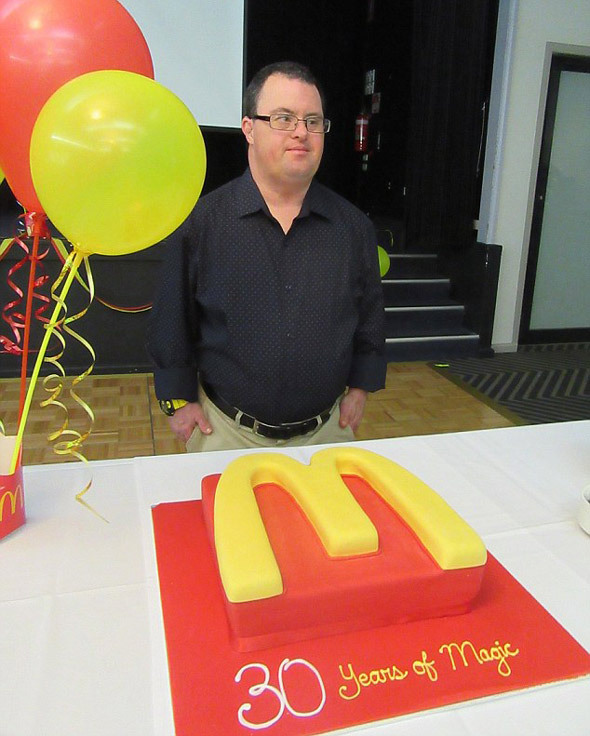 Russell matched the 32 years of service achieved by another fellow McDonald’s employee with Down syndrome, Freia David. Freia David, whose first name is pronounced “fry-a,” worked the fry station at a McDonald’s for 32 years, according to the Huffington Post. David’s job at McDonald’s was “her life,” her mother Anneliese told the Boston Globe. David worked five shifts a week, arriving an hour early and sometimes even dancing in front of the fry station in anticipation. Saturdays were her day off but even then, David would come into McDonald’s to eat lunch with her mom and give her friends high-fives and hugs. David, 52, was closing in on 1 million pounds of fries served when her mother noticed that her daughter was showing signs of forgetfulness. Early onset dementia is common among people with Down syndrome and her mother worried about her safety around the fryer oil and heat lamps. The job had meant everything to her but when she announced her imminent departure, how much she meant to the job instantly became clear. The Davids expected just a few old friends to show up on her last day. Instead, over a hundred people packed the McDonald’s—loyal customers, former neighbors, adults with disabilities, and their relatives—all were there to wish her well. David was showered with gifts: two cakes, cards, photo collages, a silver necklace with a McDonald’s french-fry carton pendant, her favorite Disney stuffed animals and a proclamation from the state House of Representatives. “It was nice, I’m really happy,” David told WBZ-TV. She started her job back in 1984. Even now after retiring, she still plans on popping in on the weekends just for a bite to eat.